As part of my work at Bocoup, I recently started working with browser implementers to improve the state of fieldset, the 21 year old feature in HTML, that provides form accessibility benefits to assistive technologies like screen readers. It suffers from a number of interoperability bugs that make it difficult for web developers to use. And the corresponding markup for the above example. The element is defined in the HTML standard, along with rendering rules in the Rendering section. Further developer documentation is available on MDN. Based on a query of the HTTP Archive data set, containing the raw content of the top 1.3 million web pages, we find the relative usage of each HTML element. The fieldset element is used on 8.41% of the web pages, which is higher than other popular features, such as the video and canvas elements; however, the legend element is used on 2.46% of web pages, which is not ideal for assistive technologies. Meanwhile, the form element appears on 70.55% of pages, and we believe that if interoperability bugs were fixed, correct and semantic fieldset and legend use would increase, and have a positive impact on form accessibility for the web. In January 1997, HTML 3.2 introduces forms and some form controls, but does not include the fieldset or legend elements. The FIELDSET element allows form designers to group thematically related controls together. Grouping controls makes it easier for users to understand their purpose while simultaneously facilitating tabbing navigation for visual user agents and speech navigation for speech-oriented user agents. The proper use of this element makes documents more accessible to people with disabilities. The LEGEND element allows designers to assign a caption to a FIELDSET. The legend improves accessibility when the FIELDSET is rendered non-visually. When rendered visually, setting the align attribute on the LEGEND element aligns it with respect to the FIELDSET. In December 1999, HTML 4.01 is published as a W3C Recommendation, without changing the definitions of the fieldset and legend elements. In December 2003, Ian Hickson extends the fieldset element with the disabled and form attributes in the Proposed XHTML Module: XForms Basic, later renamed to Web Forms 2.0. In September 2008, Ian Hickson adds the fieldset element to the HTML standard. In February 2009, Ian Hickson specifies rendering rules for the fieldset element. The specification has since gone through some minor revisions, e.g., specifying that fieldset establishes a block formatting context in 2009 and adding min-width: min-content; in 2014. In August 2018, I proposed a number of changes to the standard to better define how it should work, and resolve ambiguity between browser implementer interpretations. As part of our work at Bocoup to improve the interoperability of the fieldset and legend child element, we talked to web developers and browser implementers, proposed changes to the standard, and wrote a lot of tests. At the time of this writing, 26 issues have been reported on the HTML specification for the fieldset element, and the tests that we wrote show a clear lack of interoperability among browser engines. Of the 26 issues filed against the specification, 17 are about rendering interoperability. These rendering issues affect use cases such as making a fieldset scrollable, which currently result in broken scroll-rendering in some browsers. These issues also affect consistent legend rendering which is causing web developers avoid using the fieldset element altogether. Since the fieldset element is intended to help people who use assistive technologies to navigate forms, the current situation is less than ideal. In April of this year, Mozilla developers filed a meta-issue on the HTML specification “Need to spec fieldset layout” to address the ambiguities which have been leading to interoperability issues between browser implementations. During the past few weeks of work on fieldset, we made initial proposed changes to the rendering section of the HTML standard to address these 17 issues. At the time of this writing, these changes are under review. Web developers also struggle with changing the default behaviors of fieldset and legend and seek ways to turn off the “magic” to have the elements render as normal elements. To address this, we created a proposal to extend the -webkit-appearance CSS property with a new value called fieldset and a new property called legend that are together capable giving grouped rendering behavior to regular elements, as well as resetting fieldset/legend elements to behave like normal elements. The general purpose proposed specification for an "unprefixed" CSS ‘appearance’ property, has been blocked by Mozilla's statement that it is not web-compatible as currently defined, meaning that implementing appearance would break the existing behavior of websites that are currently using CSS appearance in a different way. We asked the W3C CSS working group for feedback on the above approach, and they had some reservations and will develop an alternative proposal. When there is consensus for how it should work, we will update the specification and tests accordingly. We had also considered defining new display values for fieldset and legend, but care needs to be taken to preserve web compatibility. There are thousands of pages in HTTP Archive that set ‘display’ to something on fieldset or legend, but browsers typically behave as display: block was set. For example, specifying display: inline on the legend needs to render the same as it does by default. In parallel, we authored an initial specification for the ‘-webkit-appearance’ property in Mike Taylor's WHATWG Compatibility standard (which reverse engineers web platform wonk into status quo specifications), along with accompanying tests. More work needs to be done for the ‘-webkit-appearance’ (or unprefixed ‘appearance’) to define what the values mean and to reach interoperability on the supported values. We have started looking into testing accessibility explicitly, to ensure that the elements remain accessible even when they are styled in particular ways. This work has uncovered ambiguities in the specification, which we have submitted a proposal to address. We have also identified interoperability issues in the accessiblity mapping in implementations, which we have reported. Meta bugs have been reported for each browser engine (Gecko, Chromium, WebKit, EdgeHTML), which depend on more specific bugs. In Gecko, the bug Implement fieldset/legend in terms of '-webkit-appearance' currently has a work-in-progress patch. 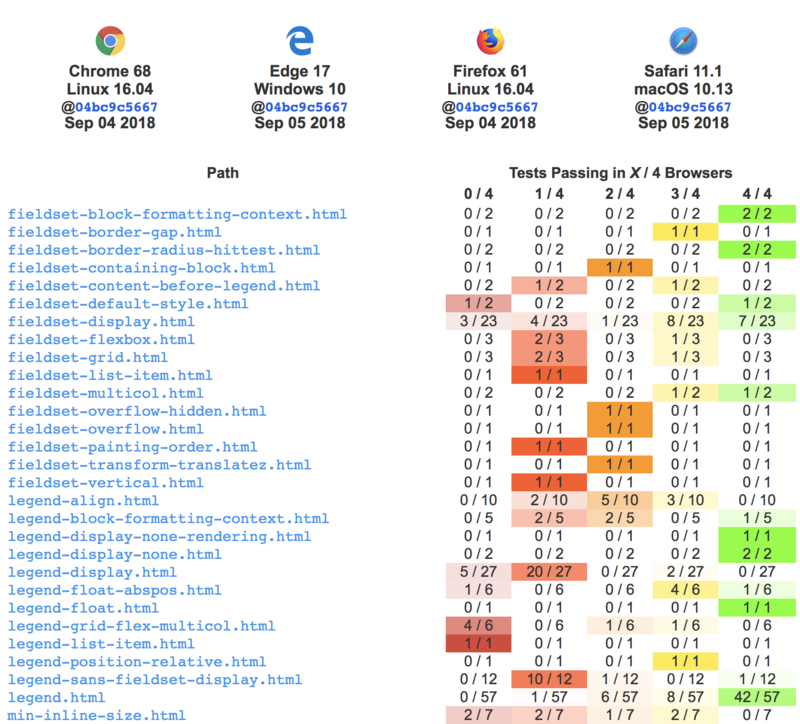 The WebKit and Edge teams are aware of bugs, and we will follow up with them to track progress. The fieldset and legend elements are useful to group related form controls, in particular to aid people who use assistive technologies. They are currently not interoperable and are difficult for web developers to style. With our work and proposal, we aim to resolve the problems so that they can be used without restrictions and behave the same in all browser engines, which will benefit browser implementers, web developers, and end users. To get notified of future Review Draft publications you need to watch the Living Standard’s corresponding GitHub repository. You’ll find these repositories linked from the top of the standard. Then you can filter the emails generated by watching this repository by looking for the subject-line prefix “Review Draft Publication:” which the WHATWG will consistently use as per the Maintainer Guidelines. Watching the repository is the only way to get notified going forward. This blog post serves as an initial announcement and as a way to make everyone familiar with the process going forward. Thanks for reading through three non-technical posts in a row. It will get technical again soon! The recent changes to the WHATWG are designed to help the web-standards development community work together across the broadest possible spectrum of developers, implementers, and end-users. As part of this change, we decided to move our standards from being licensed under the CC0 public domain dedication to the CC BY license. This decision was not made lightly. We valued the alignment of CC0 with the original public domain dedication of the WWW project; the ease with which it allows remixing and refactoring of standards; and the way in which it allows copying of snippets or examples into software that implements or uses the standards. While CC0 is beneficial in some ways, it also has some disadvantages. The lack of an attribution requirement may seem convenient, but it can also cause confusion in the standards community. For example, there are derivative specifications ("forks") that are not prominently identified as copies of WHATWG standards. Such unattributed forks create confusion both about the origin of the standard and about any applicable intellectual property rights (IPR) commitments. Use of the CC BY license makes it easier for implementers to trace what they are implementing back to the original source and its accompanying IPR commitments. Additionally, CC0 is not approved by the Open Source Initiative. Although their reasoning is not very applicable in the context of the WHATWG, which has its own system for patent grants, this lack of approval from a prominent organization involved in defining "open source" can discourage participation. Moving to CC BY addresses these disadvantages and also allows for a reduction in license proliferation. We were able to replace the custom license of the HTML Standard, which was a source of some confusion, with CC BY. CC BY still allows modification and redistribution, but adds on the relatively modest burden of attribution. We believe that, on balance, this change is the best path forward for the community. The Working Mode has been updated to reflect the way the WHATWG operates. The IPR Policy envisions WHATWG operating as a set of workstreams, each developing a Living Standard (or possibly a set of inextricably interdependent Living Standards). Contributors to workstreams make a binding promise to license their contributions and any patents covering them on a royalty-free basis; there is also a new mechanism to generate broader commitments on periodic snapshots of the Living Standards. There is a Steering Group (see the whatwg/sg repository) to oversee the IPR Policy and to ensure that Living Standards are developed per the WHATWG Principles. To stay true to our culture, we’ve created the most effective legal and governance policies we think can serve that purpose. The new Steering Group is empowered to implement the policies, address problems that arise, and to modify them to minimize problems in the future. The WHATWG remains a community. Contributions are invited from all, with no membership or fees. Communication is conducted in public, with proposals judged by their technical merit, the community, and implementers. A noticeable change is a request to make a legally binding promise to offer a royalty-free license on any relevant patents, via our new Contributor and Workstream Participant Agreement. Functionally, this process is similar to signing a CLA when contributing to an open-source project. Once you’ve done that, we hope participants will notice the changes to WHATWG mainly as an exception handling mechanism, and not part of the day-to-day workflow. To give employers and individuals a fair chance to review the agreement, the IPR Policy, and their patents, there's an initial grace period. Until January 11th, 2018, you can continue to participate and contribute even if you haven't yet signed the agreement. After the grace period is over, you'll have to sign the agreement to continue to participate. Of course, you're welcome (and encouraged!) to sign early. Principles: These serve as a guide to participants, editors, and Steering Group representatives, and are meant to capture the essence of the WHATWG. Contributor and Workstream Participant Agreement: This document secures an appropriate intellectual property commitment from participants. Those who work in the field of web technologies will need their employer to sign this as well. All contributors will agree to this (possibly automatically via their employer). IPR Policy: This document describes new processes to publish Review Draft snapshots of Living Standards for patent review, exclusion, and commitment. This process is similar to that used by many other standards development organizations, but on a regular cadence instead of waiting for a formal draft or final publication. This document is primarily intended for lawyers. Workstream Policy: This is a more formal document that defines terms and describes how workstreams are created and operate under the IPR Policy. Working Mode: This explains how WHATWG works day-to-day — what editors do, how participants can file issues and suggestions, the criteria for making decisions about the content of Living Standards, and how to deal with disagreements. This document was published before the recent changes, but has integrated some small updates. Steering Group Agreement: This is the contract among the founding Steering Group members, defining key terms and describing the WHATWG’s purpose, roles, and antitrust policy. Steering Group Policy: This document describes how the Steering Group operates. FAQ: Answers to all sorts of other questions that come up, both about the WHATWG in general and this new structure in particular. The Steering Group may modify these documents by strong consensus or supermajority vote if necessary. What do I need to do to participate in the WHATWG now? What effect will this have on the WHATWG’s standing as a standards organization? It closes a gap, as standards organizations are expected to have an IPR Policy and governance structure. And with more implementers on board, it should also reduce the confusion around which version of a standard to use. The community working there. Living Standards are informed by input from contributors, driven by workstream participants, articulated by editors, and coordinated by the Steering Group. If necessary, controversies are resolved by the Steering Group with members appointed from the organizations that develop browser engines. Substantive technical objections are considered and resolved by the Steering Group, consistent with the principles of the WHATWG. The WHATWG continues to develop standards as a public community, with input from all. Anyone can contribute to standards here. Even with the Steering Group in place, editors still adhere to the Working Mode, making a judgment call as to whether a change or addition will have multi-implementer support. The main practical difference is that now there is a formal appeals path, in case a Workstream Participant disagrees with the editor’s judgment around multi-implementer support. Additionally, the founding members have helped the community put in place a legal framework to promote royalty-free licensing for Living Standards. Does the WHATWG operate by consensus? The WHATWG strives for rough, informal consensus among contributors when drafting Living Standards. After considering input from all parties, the editor of a Living Standard makes the judgment as to whether a feature has enough support behind it to include. Those disagreeing with the editor's judgment can, under what we hope are exceptional circumstances, appeal to the Steering Group, which does have a formal consensus policy. I believe there are problems with a Living Standard, but the Editor does not agree. What can I do? Present evidence that the standard does not accurately describe how browser engines interoperate today or how they will work in the near future, and convince other workstream participants to support your change proposal. If there is sustained disagreement in the workstream, appeal to the Steering Group to resolve the dispute. I was not able to engage with the WHATWG productively in the past. Why should I try again? The WHATWG now has a clearly documented Working Mode that makes the process more transparent and less surprising. Additionally, everyone is expected to abide by the Code of Conduct. Can other organizations become part of the Steering Group? If additional integrated browser engines beyond Blink, Edge, Gecko, and WebKit get significant mindshare and market share, the Steering Group is empowered to invite the organizations behind them to sign the Steering Group Agreement and participate there. This fits with the primary role of the Steering Group in resolving disagreements about whether something will be widely implemented in leading browser engines; apart from that, organizations in the community all participate in the same way. In a previous post we’ve already explained how interoperability is important to the WHATWG. Without it, we’re writing fiction, and in the world of standards that is no good. From a similar perspective, we’ve now more clearly documented how the WHATWG creates standards. The Working Mode document describes what is expected of editors and contributors, what criteria any changes to standards must fulfill, and gives guidelines for conflicts and tests. What has changed the most since 2004 is requiring tests and implementer support for any changes made. These should help ensure that decisions need not be revisited again. Documenting our processes is also new and is born out of necessity due to the wider range of standards the WHATWG maintains. We appreciate any feedback on the Working Mode document as it can undoubtedly be refined further.